COLONIAL BEACH, VA -- (MARKET WIRE) -- February 1, 2007 -- While Valentine's Day involves expressing love for one's sweetheart, author Sherryl Woods knows that, more and more, the holiday finds women focusing on another kind of love -- the heartfelt affection for friends. "It's wonderful to have people in our lives who know our secrets and love us anyway," says Woods, who writes about the strength of women's friendships in her February novel, STEALING HOME. The story about three South Carolina friends who open a women's fitness spa underscores the importance of such relationships when divorce, health crises and troubled teens shatter their peaceful worlds. The former journalist and USA Today bestselling author of more than 100 novels divides her residence between Key Biscayne, FL and Colonial Beach, VA. She says the stacks of mail she receives weekly always contain stories about the importance of friends in women's lives. "They tell me their friends bring a different perspective to who they are," Woods said. "Their friends tell them the unvarnished truth when they need to hear it, and laugh with them over their dreadful mistakes in fashion, in men, even at times in their career choices. It's only natural that when it comes to Valentine's Day, women shell out serious bucks on cards and gifts for the friends who have carried them through life crises." Released just in time for Valentine's Day, Woods' STEALING HOME, finds Maddie Townsend facing an uncertain future when her pediatrician husband abandons her for his younger, pregnant nurse. Beyond coping with her own anguish and outrage, Maddie has a 16-year-old son spinning out of control, his talkative brother has suddenly gone silent, and her six-year-old daughter can't grasp why daddy's not coming home. March's A SLICE OF HEAVEN and April's FEELS LIKE FAMILY find Maddie's two friends dealing with a daughter's eating disorder and a personal health crisis. The women in Woods' trilogy have been friends since high school, which meshes with a statistic cited by a Hallmark trends expert. "Our research showed most people establish lifelong friendships between the ages of 15 and 25," said Marita Wesely-Clough. "Longtime friends go through significant or traumatic life experiences together, supporting each other over time." For more insight into Sherryl Woods and women's friendships, visit www.sherrylwoods.com. 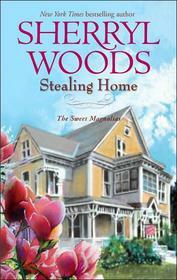 For a review copy of STEALING HOME, e-mail nancy@nancyberland.com.